The best value in window tinting in Ballarat and across Western Victoria. Learn about Double Glazing vs Window Tinting. Our part of the world is getting hotter. Standard pre conceived ideas of energy reduction for homes and offices are out the window, literally! Most of the guidelines regarding energy efficiency in new and existing building construction, are modelled on outdated and skewed data mainly taken from North America, Europe and on average, colder climates which have no bearing or relevance to our climate in Victoria. Most architects and builders for example, are now designing homes with more glass, often double glazed and most with no overhanging eves. These design features may, when put up against the northern hemisphere model give excellent energy efficient data. In Victoria however, as our average temperatures rise, these designs in truth seriously affect energy ratings and as a consequence your back pocket. Double glazed window systems are great for areas that experience extreme cold for the majority of the year. In temperate climates like Victoria however , where we experience 4 distinct seasons. Double glazing although helpful when cooler and beneficial for sound and noise insulation, is detrimental during the increasingly hotter spring, summer and autumn seasons. Double-glazing offers no UV protection, Zero glare reduction, no privacy and most importantly, no radiant heat gain reduction. 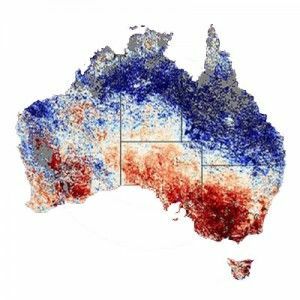 This map of Australia shows how the land surface temperature from January 25 to February 1 compared to the average mid-summer temperatures the continent experienced between 2000-2008. Places where temperatures were warmer than average are red, places experiencing near-normal temperatures are white, and places where temperatures were cooler than average are blue.